Based on our popular 3x3 tarp, and born out of innovation and testing in the field, the DD Tarp 3x3 - Pro offers limitless set-up options and versatility with a number of new and advanced features as detailed below. - 21 reinforced attachment points (2 more than the DD Tarp 3x3) allow for the Tarp 3x3 Pro to be set up in countless ways. - 16 eyelets placed on each outer attachment point to allow the DD Tarp 3x3 Pro to be used with poles or pegged tightly onto the ground. 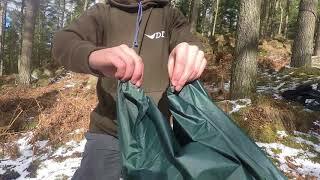 - Guy line stowage loops: corner and middle side loops have velcro to allow folding and storing the guy lines when packing - (handy to keep the guy lines tangle-free between uses, while still connected to the tarp for quick set-up). - Press studs: positioned on two sides of the tarp these allow you to attach multiple tarps together (up to a maximum of 4 tarps in a large 6m x 6m square shape). Also allow advanced tarp configurations for both hammock and ground dwellers: for example, close one end together when used in the diamond formation with a hammock. From using the additional extra tarp attachment points and eyelets to enhance your tie-out options, to using the press studs to enclose your shelter in tough winds, or attaching more than one 3x3 Pro together, this really is a multifunctional tarp. Even when packing away and setting up, the very handy guy rope attachment points will save time and hassle - the tarp 3x3 Pro really does have every angle covered! 21 tough, reinforced attachment points: 16 around the sides and corners, and 5 creating an 'X' shape in the middle.